/ Events / Good Neighbours Awards! The Good Neigbours Awards Celebration is an annual event hosted by the Association of Neighbourhood Houses of BC (ANHBC). ANHBC owes its long-standing history to its many volunteers, community supporters, and neighbours. The Good Neighbours Awards offer an opportunity for staff, volunteers, and clients to come together to celebrate and honour those who have made significant and long lasting contributions to our Neighbourhood Houses and communities. 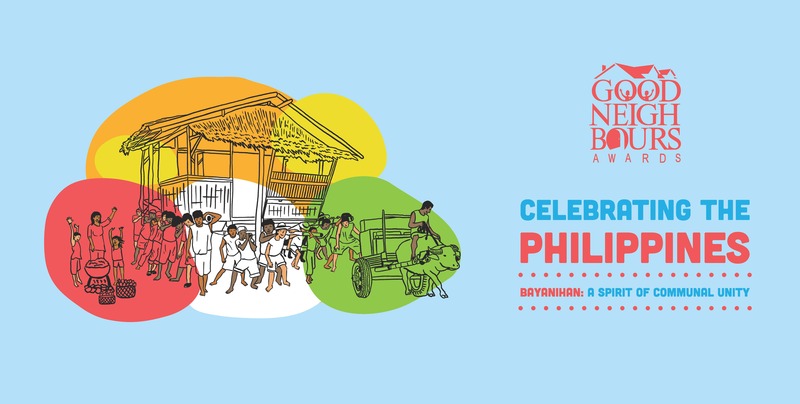 This year, we are celebrating the Phillipines and the theme is "Bayanihan: spirit of communal unity". Doors open at 5:30pm; dinner at 6:30pm; awards ceremony follows at 7:30pm. British Columbia Good Neighbours Award: Honours one special neighbour whose activities and contributions have benefited neighbourhood(s) in several communities in the Province of British Columbia. Neighbourhood House Good Neighbours Award: Honours a neighbour from a Neighbourhood House who has provided long standing community leadership and improved the well-being of people in their neighbourhood. Corporate Good Neighbours Award: Acknowledges a corporation’s significant contribution and long lasting support of Neighbourhood House activities. Youth Good Neighbours Award: Acknowledges a youth who has demonstrated commitment to a Neighbourhood House, their school and neighbourhood through volunteer activities.